About Tidelands and "Dog Named Bart": “Refreshing, stimulating, and likely to induce daydreaming. It doesn’t sound much like anything else.” – My Old Kentucky Blog Bay area-based duo Tidelands returns on March 3rd, 2015 with a new EP “Old Mill Park,” the follow-up to its 2012 sophomore full-length album "We’ve Got A Map." The release of the new EP is preceded by the single “Dog Named Bart” (including vocal contributions from John Vanderslice and frequent Tidelands collaborator Debbie Neigher.) Comprised of guitarist and vocalist Gabriel Leis and drummer Mie Araki, Tidelands is a duo by circumstance instead of design. Teaming up amid the ashes of a previous band, the pair started using loops to fill out its sound. “That created a sound of its own, and directed my songwriting for the first couple years of the band,” says Leis. “What I didn’t count on was becoming reliant on it.” There’s a fine line between a tool and a crutch, and the songs on “Old Mill Park” are responses to the band’s acknowledgement of this fact. “I wanted to write and record songs that would stand on their own with just an acoustic guitar and my voice,” Leis explains. This time around, the basic guitar, upright bass, drum, and vocal tracks were all recorded live in the studio as full takes. Only later did the band “get all Tidelands” with the songs, building them up with strings (once again collaborating with the Magik*Magik Orchestra), keys, horns and harmonies to create the most realized and memorable Tidelands tunes to date. Suckers for handclaps will revel in “Dog Named Bart,” the first single from the new EP. The track also features the fantastic drumming of Araki, the trumpet of John Freeman, and arrangements by Minna Choi of Magik*Magik Orchestra. “I gotta give a shout out to JV for altering the phrasing and delivery of the vocals that we all sung together,” acknowledges Leis of Vanderslice’s essential contributions. With all of the teamwork on “Old Mill Park,” it’s clear that Tidelands has successfully broken out of the box that being a “duo by circumstance” may have put them in. 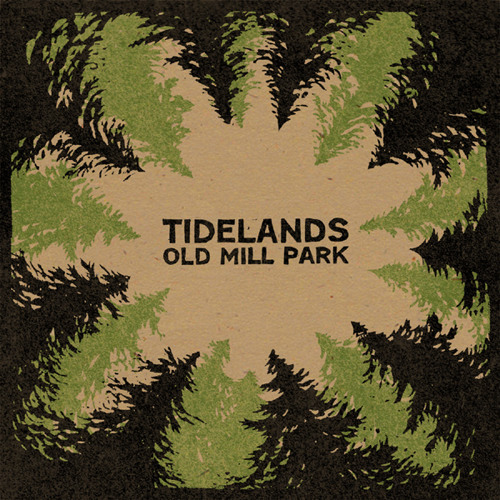 “Old Mill Park,” the new EP by Tidelands arrives on March 3rd, 2015.